The Millennium Falcon? A microscope, florence flask, and a broadsword? Someone wearing a cat-robot suit? Have you ever seen a t-shirt packed with so much awesome, that you almost doubted the mere existence of such a thing? I’m excited to share that we have that shirt, and it’s everything you’ve dreamt of. 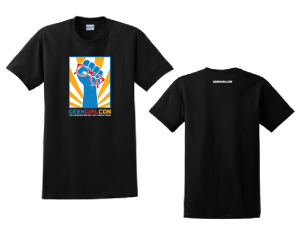 Last week, we launched our first ever fundraising tee. 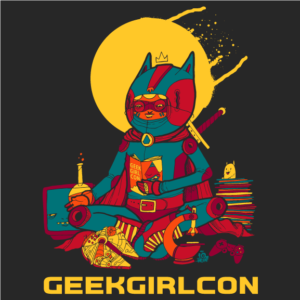 The fabulously nerdy shirt features art by local Seattle artist and designer Ten Hundred (Peter Robinson). All proceeds will go towards helping us host a great convention, which is barely one month away. You can purchase the shirt in both straight cut and fitted sizes online right now. Unisex version of the shirt, available on booster.com. These shirts are exclusive and limited edition. Once they sell out, they’ll be gone! 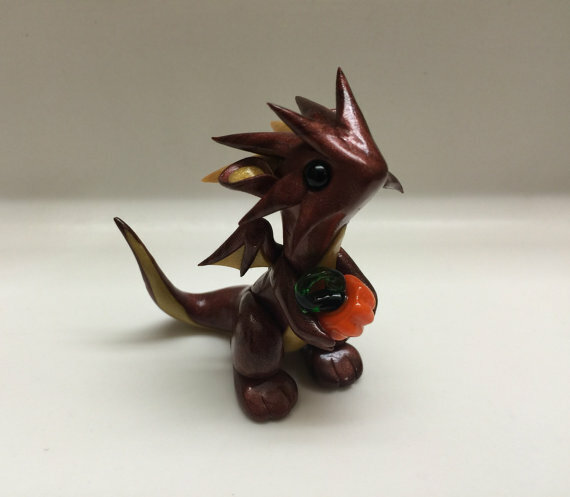 The fundraiser ends in approximately 17 days as of this posting, so make sure to grab yours soon. 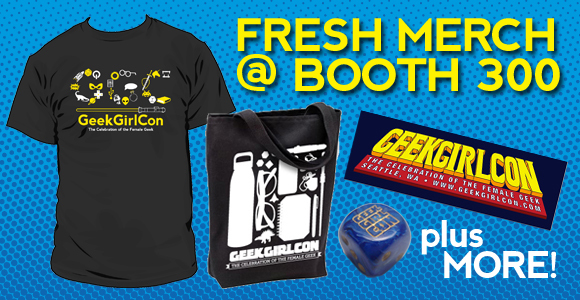 We know you like to show your GeekGirlCon pride all year round, so come check out our Merchandise Booth in the exhibitor hall (Booth 300), where we’ll have a ton of awesome goodies at great prices. 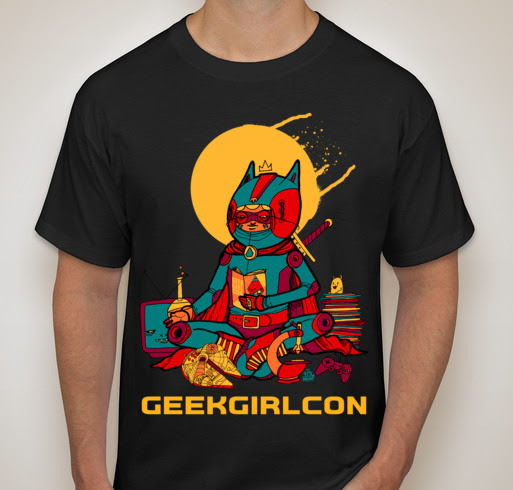 Shirts sporting this year’s GeekGirl Power logo are available in Youth sizes S-L, Basic S-5XL, and Fitted S-XL. 16oz travel mug. Microwave and dishwasher safe. 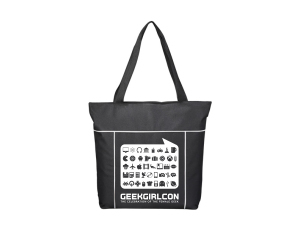 Sturdy, roomy zippered tote bag. 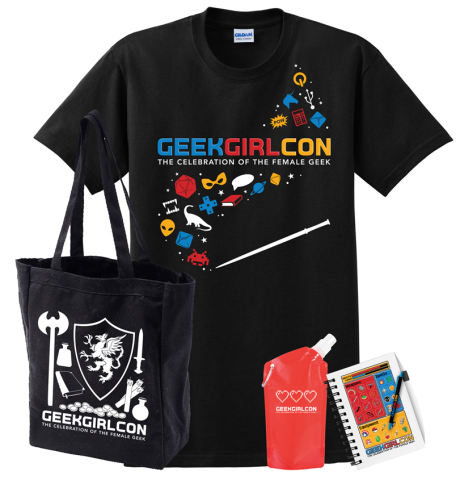 Spend $40 or more on our merchandise for a free GeekGirlCon D6, or at least $80 for a full dice set. 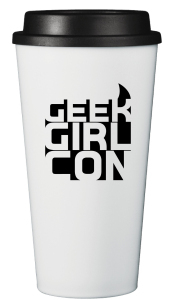 GeekGirlCon ’13: Sneak Peek at Merch! 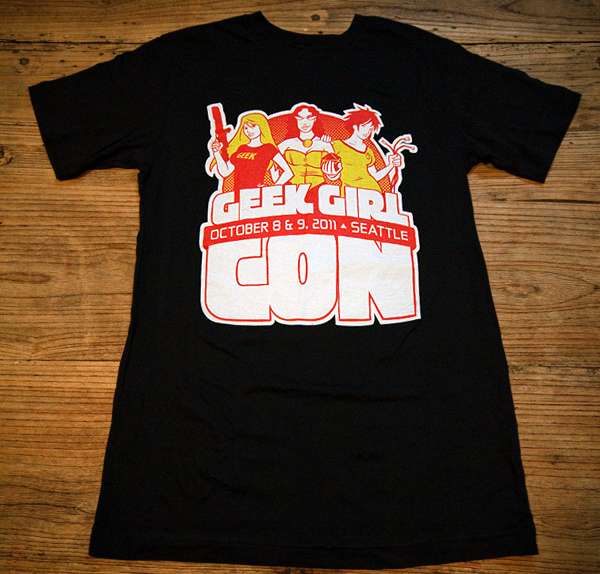 Shubz Blalack, Merchandise Manager, here to give you a sneak peek at GeekGirlCon ‘13’s merchandise! Enjoy! Our shirt is a must for the veteran or rookie con-goer! Choose from straight-cut, fitted, or children’s sizes. You can find all of these and more at our merchandise booth! 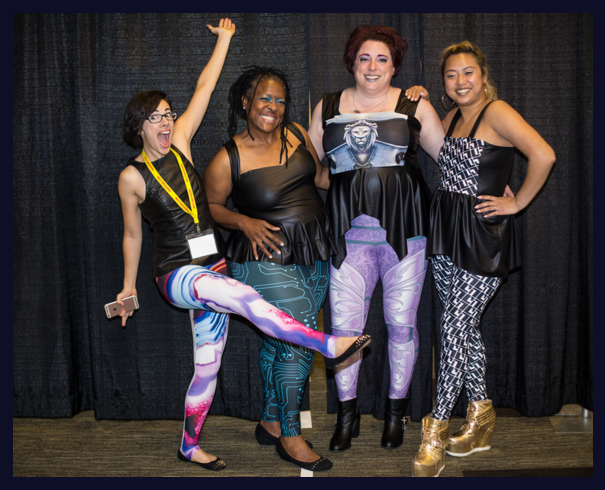 Don’t delay—all of our merchandise is limited edition, so items may sell out! 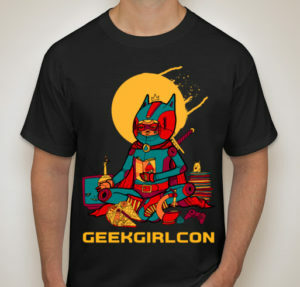 Get your passes to GeekGirlCon 2013 and check out the rest of our wares! We’ll be in the Exhibitor Hall on the 3rd floor, Booth 300. 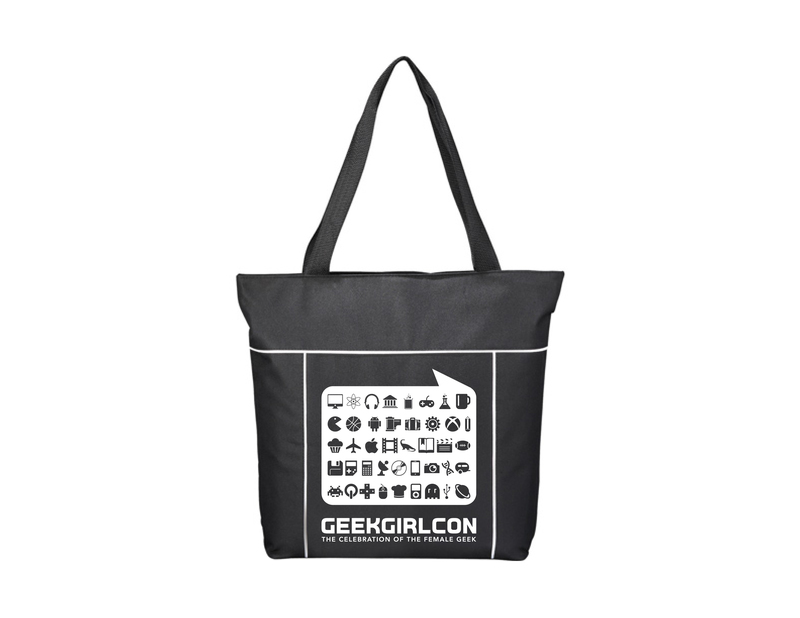 Looking for a holiday gift for that geek girl in your life? 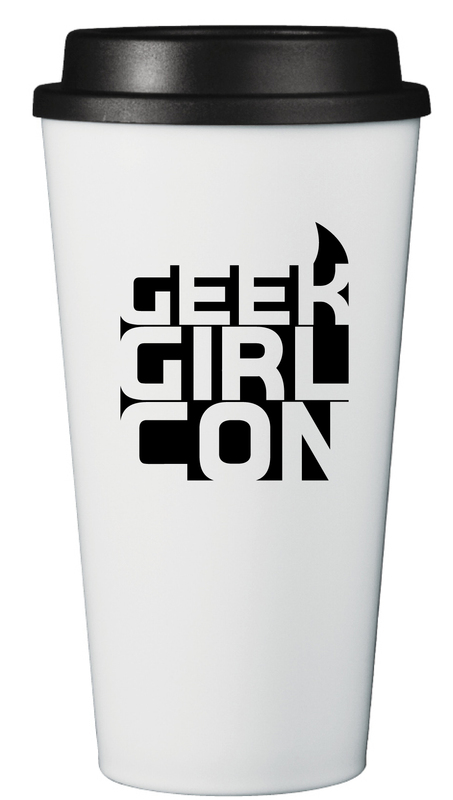 GeekGirlCon has great deals on our 2011 con merchandise at our Etsy store. Couldn’t make it to Seattle? Or you made it to the con, but were low funds? You are in luck! T-shirts, tote bags, stickers, and pins are all available for purchase. Get a piece of geek girl history for yourself or that special geek in your life. 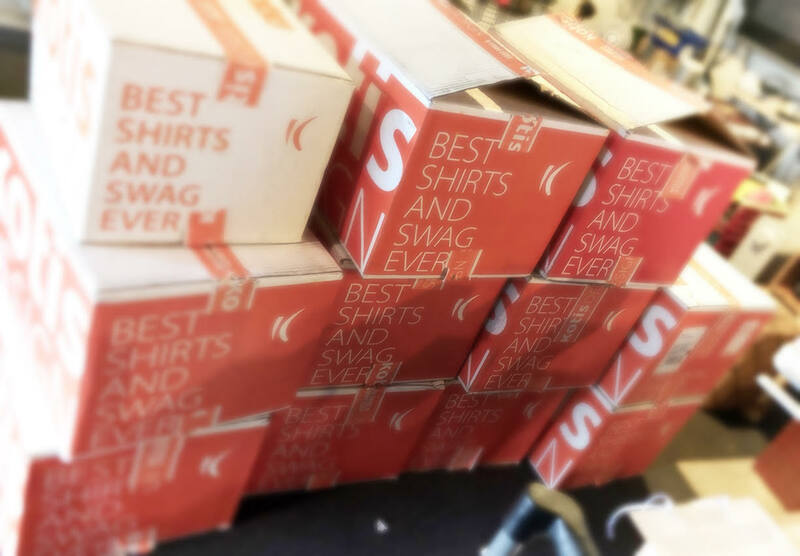 Act now, because when the 2011 gear is sold-out — it’s gone for good! To receive your shipment in time for Christmas, you must place your order no later than December 21st.